Kavi Uddheshichathu movie satellite rights purchased by surya tv. We have recently posted about the satellite rights of oru muthassi gadha. surya tv is added lot of latest malayalam film rights in 2016. kavi udheshichathu is releasing on 8th october 2016 all over. Adam’s World Of Imagination is the banner producing this film. Kohinoor was the first film from Adam’s World Of Imagination and surya tv purchased it’s rights. Asif Ali & Sajin Jaffar are the producers of this film. all are expecting a good film, it’s facing tough battle from puli murugan. thoppil joppan and puli murugan are the films now running on theaters. 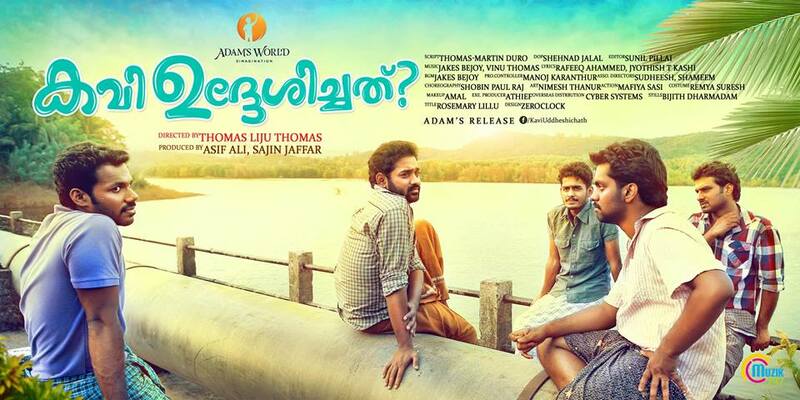 Asif Ali, Biju Menon, Narain , Anju Kurian, Balu Varghese, Lena, Bijukuttan etc are in the lead role of this film. Asif Ali playing the role of Kavalam Jimmy and Biju Menon playing the character Minnal Simon. Narain As Vattathil Bosco is another important character in this film. Bindu Panicker, Veena Nair, Pradeep Kottayam, Sasi Kalinga, Ganapathi, Sudhi Koppa, Sija Rose are in supporting star cast of Kavi Uddheshichathu. Thomas Liju Thomas is the director of this movie, this is his first film. Thomas Liju Thomas done a short film named ” ramaniyechiyude namathil”. Kavi Uddheshichathu movie trailer got massive responses, expectation for this film is huge. puli murugan movie got terrific responses from theaters. creators behind this film is very confident to release against puli murugan. surya tv added lot of new films to their library. we have updated surya tv satellite rights 2016 at keralatv.in. you can expect more film rights soon here. stay tuned here and subscribe us for all latest updates about malayalam tv channels.